I don't usually do posts like this but since it's hump day (why won't this week end?) I decided some online browsing would be a good way to cheer myself up. I was looking specifically at new bags since many of mine are getting a little old and looking to retire. 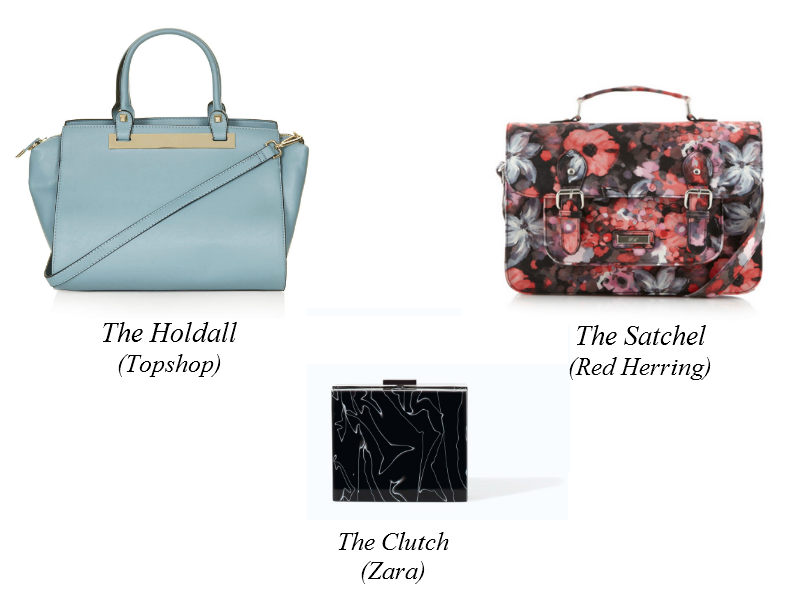 These are some of my favourite high street picks at the moment. The Zara clutch is extremely tempting but the price tag means I'll be holding out until the sales for it. London is currently in the depths of despair and misery (a.k.a. a tube strike). This is the part where I would brag that my commute was fine, but sadly it took me to a dull lecture. I should have just stayed at home. I know, I can't wait for the weekend. Thursdays are the worst I feel - so not looking forward to tomorrow! Love the topshop bag - it's such a great colour! Aw I hope your day was actually okay Winnie. I'm kind of annoyed my Fridays are now filled up and take ages to end. I agree about the Topshop bag, the blue is so pretty! Me too :) and I will do!